Every beach on our extensive best beach holidays list is a miracle of nature, a fortunate by-product of geography, a mass of sun-kissed sand rolling down into a shimmering sea. But, so are thousands of other beaches around the world which weren’t quite heart-stopping enough to merit a mention in our travelling equivalent of the Forbes Richest 100. This is because, for a beach to be truly world class, it must fuse awe-inspiring natural beauty with an extra something special. And Tulum, Mexico has been doing this for over eight hundred years. 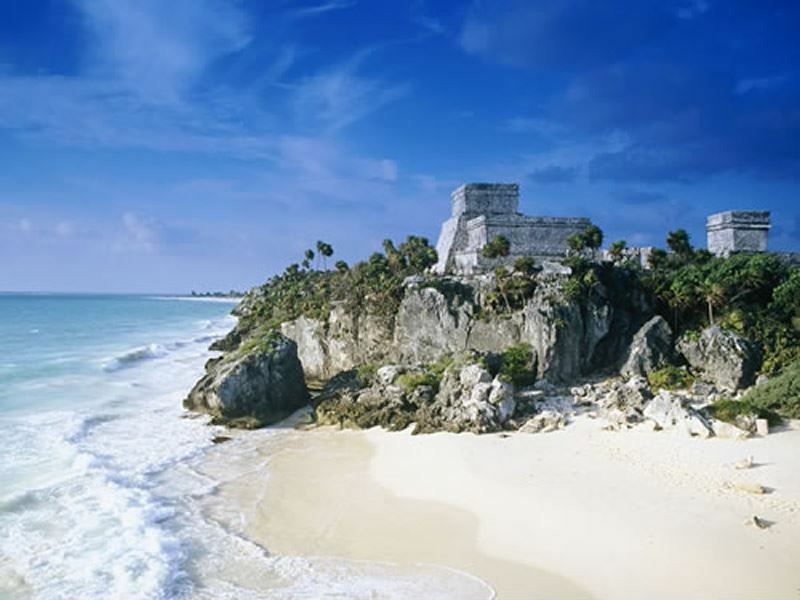 Tulum is the site of a pre-Columbian Mayan walled city on the Yucatan Peninsula of Mexico’s east coast. The tumbledown temples in this low-rise, high-key ocean strip are distant remnants of a dynasty. It was protected on one side by a five metre tall eight metre thick wall and, on the other side, steep sea cliffs cascading down to a beach below; surely the most majestic backdrop of any beach in the world. And the beach isn’t too bad either. Powdery diamond white sand crowns a lapping turquoise sea with coconut fringed palm trees swaying silently above. The beauty of the Yucatan Peninsula has inevitably led to an invasion of travellers eager to see what the fuss is all about. You can take your pick of tourists; riotous spring break revellers in Cancun screaming “YOLO!” as they jump off hotel balconies into a swimming pool below or busloads of studious culture vultures in Tulum with cameras hanging round their necks and clipboards tucked under their arms. Most people would agree that the vultures are the lesser of the two evils. Subsequently, it is advisable to stay overnight and visit the ruins early in the morning when your only companion is a blood red Caribbean sunrise. Accommodation ranges from tiki-hut style eco lodges through rustic hammock-lined wooden bungalows to luxurious all-inclusive resorts. For many, choosing one of the first two options is certainly a better way to experience the bohemian charm of Tulum. Tulum has a strict bedtime of midnight which is not surprising for a town bereft of streetlights. However, as night falls it becomes obvious why no one’s ever bothered applying for planning permission. The sky illuminates the land below with thousands of stars shining like a carpet of candles. This relatively early closing time nicely portrays how Tulum is part hedonistic and part holistic. It is, perhaps, unsurprising that Tulum is tinged with a touch of soothing decadence; it’s a footprint of a legacy left by the fun-loving, mystical Mayans. Tequila, mescal and mojitos are sandwiched between beachfront yoga and new age healing rituals such as hot stone massages and historic Mayan energy workshops. I’m not quite sure what the latter is but it sounds as good for the soul as tequila is bad for the head. The beach is also protected by a bountiful barrier reef, second only in size to the great one in Australia, which harbours a kaleidoscopic array of tropical fish and sea creatures. Eye-catching animals are not restricted to the ocean either; the intrepid traveller can spot pelicans, turkey vultures and howler monkeys. The locals also speak of a friendly jaguar who prowls around the forefront of the jungle. I didn’t stick around to test his friendliness. However, if he’s anywhere near as welcoming as the people, the sun or the beach in Tulum, I wouldn’t mind meeting him. More information and to book: The low-rise hacienda-style Dreams Tulum Resort & Spa is a five star all-inclusive resort set on a stretch of pristine palm-fringed beach. It is only five minutes away from the spectacular ancient Mayan ruins at Tulum, which can be reached by bicycle tour from the hotel.